The question today for spot gold prices is whether we are going to see yet another long legged doji on the daily gold chart to make it five in a row, and a full house on the week. Having initially moved lower in early trading following a higher US dollar after retail sales came in marginally below expectations spot gold prices remained uncertain as to which direction to take once again. A weakening of the US dollar in later trading did manage to see spot gold prices move back into positive territory where they settled $3.33 higher at $956.85 per ounce. 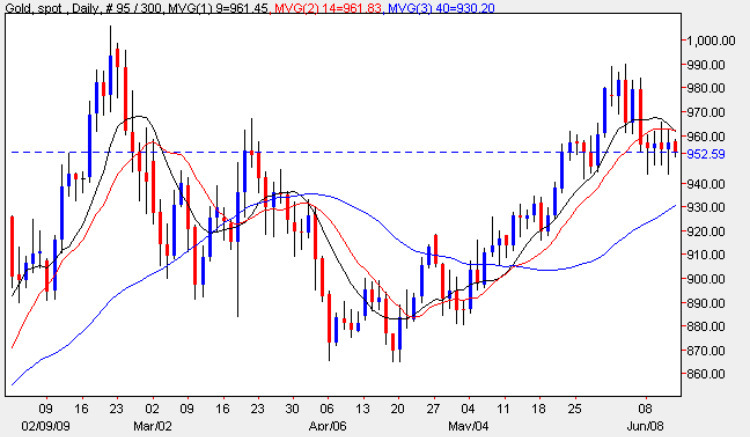 From a technical perspective there is little we can glean from an analysis of the daily gold chart other than the obvious fact that gold prices are in a period of consolidation within a very tight range, and the only items of note are as follows: first that the 9 day moving average is about to cross the 14 day moving average which may suggest a bearish tone, and second that the close of each day this week has finished below the 14 day moving average. This view may be counterbalanced to some degree by the fact that despite the two significant bearish signals of last week, the price of gold has failed to follow through in any meaningful way, which in itself could be an important indication that the market has discounted these earlier signals. My trading suggestion for today is to step aside from the market for two reasons, firstly as traders will be squaring positions ahead of the weekend, and secondly all markets, including commodities and forex, are waiting for any signals from this weekend’s round of G8 meetings which are taking place in Italy. Hopefully by Monday we will have a clearer picture for the future direction of gold prices. A quick check on the weekly chart fails to provide us with any further clues other than the gold price is well above all three moving averages and, as in the daily chart, has failed to follow through on the bearish signal here as well. The short term sideways while the medium and long term are bullish.